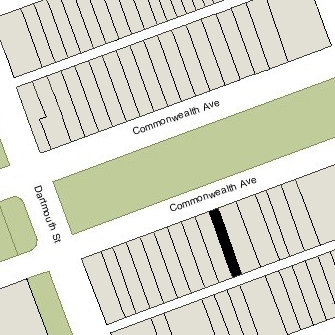 124 Commonwealth is located on the south side of Commonwealth, between Clarendon and Dartmouth, with 122 Commonwealth to the east and 126 Commonwealth to the west. 124 Commonwealth was designed by Emerson and Fehmer, architects, and built ca. 1871-1872, one of four contiguous houses (118-120-122-124 Commonwealth). The houses were designed as a symmetrical composition, with the two taller and narrower houses (118 and 124 Commonwealth) flanking the two shorter and wider houses (120 and 122 Commonwealth). 122 and 124 Commonwealth were built ca. 1871-1872, and 118 and 120 Commonwealth were built ca. 1873. On December 30, 1870, Charles Wood sold the eastern lot and 8 feet 8 inches of the western lot to Laura Lucretia (Williams) Case, the wife of wholesale dry goods merchant and banker James Brown Case. They lived at 52 Boylston and in Weston. They had 122 Commonwealth built on the combined 34 foot 8 inch lot. In April of 1872, James and Laura Case purchased two lots to the east of 122 Commonwealth, where they had 118 Commonwealth and 120 Commonwealth built. They made 120 Commonwealth their home. On March 18, 1871, Charles Wood sold the remaining 17 feet 4 inches of his western lot to Martha W. (Seaver) Cowing, the wife of Walter Herbert Cowing, and they had 124 Commonwealth built on it. Click here for an index to the deeds for 124 Commonwealth. Walter Cowing was a boot and shoe manufacturer and auctioneer, in partnership with George E. Hatch in the firm of Cowing and Hatch. The Cowings previously had lived at 314 Shawmut and, before that, at 84 Chester Square, where his partner, George Hatch, was his neighbor. The Cowings continued to live at 124 Commonwealth during the 1877-1878 winter season, after which they moved to Leicester. They continued to own 124 Commonwealth and leased it to others. By 1879, 124 Commonwealth was the home of Dr. Edwin Perley Bradbury, a dentist, and his wife, Louisa Silsby (Jordan) Bradbury. He also maintained his dental office at the house and provided office space to other dentists. The Bradburys previously had lived at the Hotel Boylston (Boylston at Tremont) and he had maintained offices at 196 Boylston. 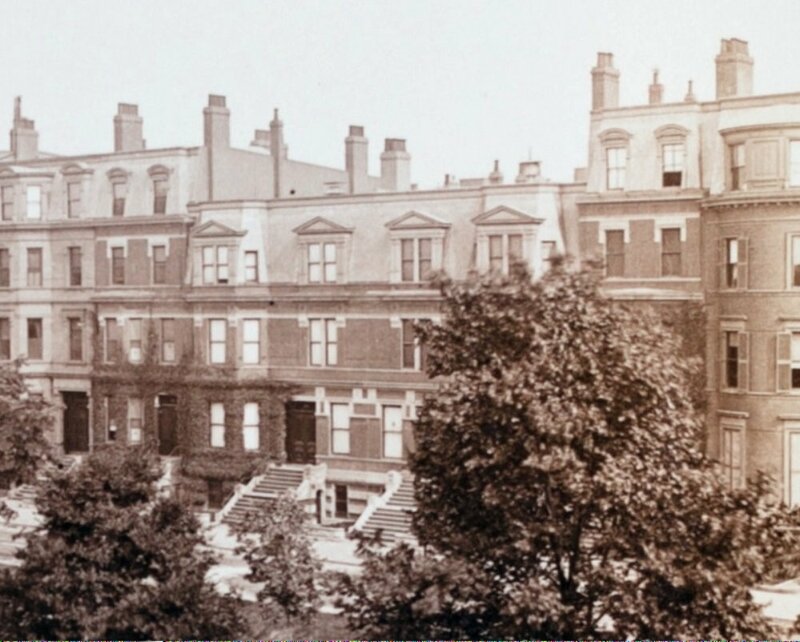 The Bradburys continued to live at 124 Commonwealth during the 1886-1887 winter season, but moved thereafter to a new home they had built at 16 Exeter (196 Marlborough). On May 5, 1887, 124 Commonwealth was purchased from Martha Cowing by Dr. Samuel Ayer Kimball. He and his wife, Belle C. (Trowbridge) Kimball, made it their home. Dr. Kimball was a physician and also maintained his office at 124 Commonwealth. They previously had lived (and he had maintained his office) at 134 Boylston. 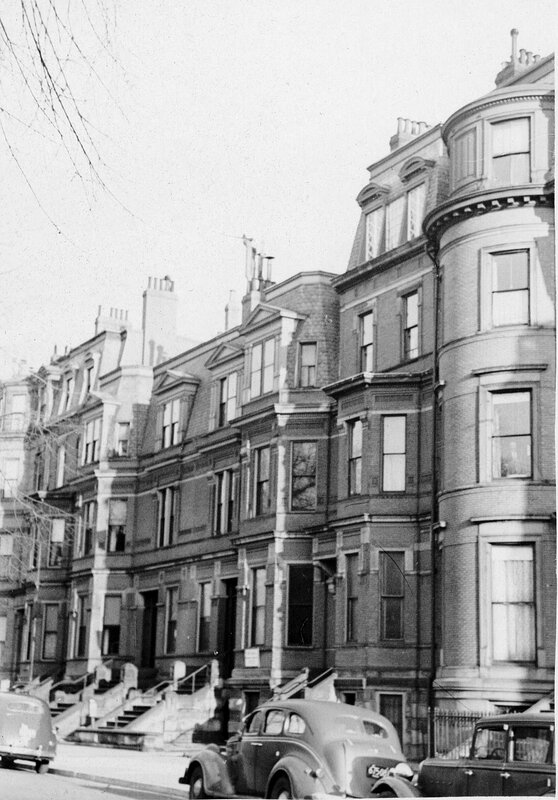 The Kimballs continued to live at 124 Commonwealth during the 1901-1902 winter season, but moved thereafter to Newton. 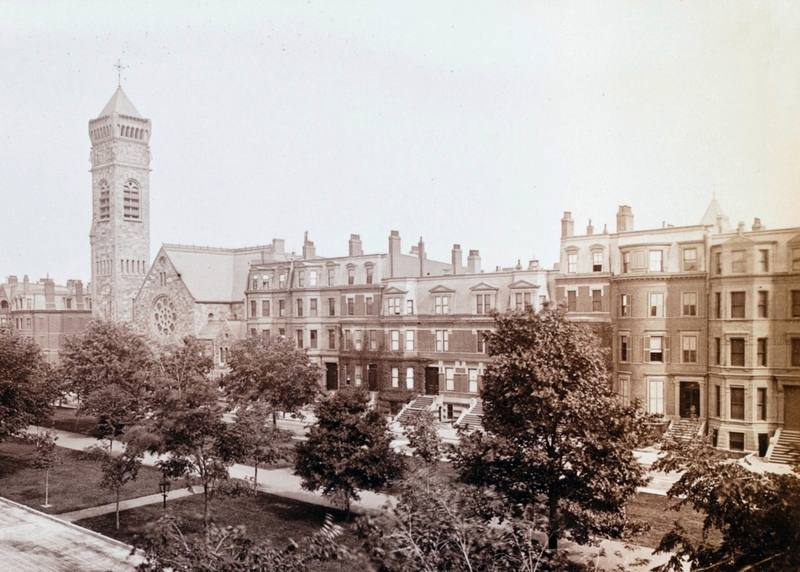 On December 13, 1901, 124 Commonwealth was purchased from Samuel Kimball by Sarah Maria (Parker) Cunningham, the widow of shipping merchant Frederic Cunningham and the mother-in-law of Episcopal Bishop William Lawrence, who lived next door at 122 Commonwealth. She previously had lived at 357 Marlborough. In his Memories, Bishop Lawrence’s son, Bishop William Appleton Lawrence, provides further detail, noting that “Pa bought Dr. Kimball’s house for Grandma Cunningham, and she moved next door; and he cut a large door through between our dining-rooms, which made it possible for us to have the Christmas and Thanksgiving parties occasionally.” The dining rooms of 122 and 124 Commonwealth were at the rear of the buildings on the first floors. Sarah Cunningham died in January of 1913, and on March 20, 1913, her executors transferred 124 Commonwealth to her daughter, Julia Lawrence, who leased it to others. By the 1913-1914 winter season, 124 Commonwealth was the home of Isaac Sweetser Tolman, a notebroker, and his wife, Mabel Wells (Leach) Tolman. They previously had lived at The Abbotsford at 186 Commonwealth. They also maintained a home at South Gloucester. The Tolmans continued to live at 124 Commonwealth during the 1917-1918 winter season, after which they moved to the Hotel Vendôme. Mabel Tolman died in November of 1918. 124 Commonwealth was not listed in the 1919-1921 Blue Books. 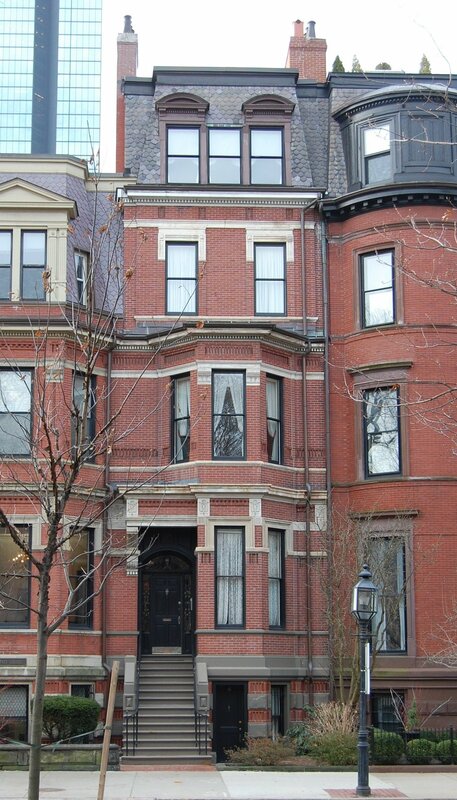 By 1921, 124 Commonwealth was the home of Joseph F. Low and his wife Harriet (Gilman) Low. He was president and treasurer of Hill, Smith, & Co., Inc., stationers. They previously had lived at 1277 Commonwealth. By 1922, they were lodgers at 228 Commonwealth. During the 1921-1922 winter season, 124 Commonwealth was the home of real estate broker Jacob C. Rogers and his wife Ann (Sanders) Rogers. They previously had lived at 180 Bay State Road. They also maintained a home in Milton. By 1922, 124 Commonwealth also had become the medical office of Dr. James Ralph Taylor, Jr., a physician, who lived in Quincy. Dr. Taylor previously had leased 118 Commonwealth. James Taylor married in 1922 to Mabel Frances (Sealy) Ludeman, the widow of John Ludeman. She was a nurse. On March 27, 1922, 124 Commonwealth was purchased from Julia Lawrence by Frederick Lincoln Blood, the husband of Dr. Taylor’s sister, Annie Eunice (Taylor) Blood. The Bloods lived in Orleans on Cape Cod and leased the house to the Taylors, who made it their home as well as his office. In May of 1922, Frederick Blood applied for (and subsequently received) permission to build a two-car garage at the rear of the house. The decision was appealed by the neighbors and overturned in September of 1922 by the State Fire Marshall, who found that allowing the garages would create a congested condition in the alleys and a potential fire hazard because of the accompanying storage of gasoline in the tanks of the cars. A similar application by Anna Johnson, owner of 118 Commonwealth, was overturned in the same decision. On April 8, 1927, Frederick Blood recorded a deed transferring 124 Commonwealth to James Taylor. The deed was dated March 27, 1922 (the same day he had purchased the house from Julia Lawrence); however, Frederick Blood was the assessed owner from 1922 through 1927. In 1930, Dr. Claude Louis Payzant, a physician specializing in internal medicine and physical therapy, moved his practice to 124 Commonwealth. He and his wife, Mary (Mamie) Frances (Doner) Moore Payzant, lived in Medford. They had married in January of 1930. In addition to his medical profession, Claude Payzant was an accomplished artist, specializing in oil paintings of maritime scenes. Mary Frances Doner was a prolific writer of romantic fiction, writing under the names Julia Ward, Hope Darrow, Virginia Chilvers, Mary Doner Moore, Mrs. Claude Louis Payzant, and others. Many of her novels were set in Michigan, where she was born. By the 1930-1931 winter season, the Taylors had moved to Canaan, New Hampshire, and Bradenton, Florida, and by the 1931-1932 winter season, the Payzants had made 124 Commonwealth their home as well as his office. On September 30, 1933, Mary Payzant purchased the house from Dr. Taylor, who continued to maintain an office there, along with other physicians to whom they provided office space. On March 25, 1944, Mary Payzant transferred the property into both of their names. Claude and Mary Payzant divorced in 1947. In anticipation of their separation, on February 14, 1947, they transferred 124 Commonwealth to Kenneth Hutchins of Medford. Claude Payzant married again in August of 1947 to Eleanor (Ellen/Helen) Millicent Yeager, and on September 8, 1947, they acquired 124 Commonwealth from Kenneth Hutchins and made it their home. In April of 1951, Claude Payzant filed for (and subsequently received) permission to convert the property from a single-family dwelling and doctor’s office to a three-family residence and a doctor’s office, with the doctor’s office on the first floor, and one family each on the second, third, and fourth floors. In 1952, the Payzants were joined at 124 Commonwealth by Melvin Maynard Johnson, as a lodger. He previously had lived at the Hotel Statler. He was the retired Dean of Boston University Law School. A nationally known Masonic leader, he had authored several books on Freemasonry in America. Claude Payzant died in December of 1953. Eleanor Payzant continued to live at 124 Commonwealth and Melvin Johnson moved to the Algonquin Club at 217 Commonwealth. Eleanor Payzant and Melvin Johnson married in August of 1954. After their marriage, they lived at 124 Commonwealth. He died in December of 1957. She continued to live at 124 Commonwealth, becoming a floral decorator, providing flowers and floral arrangements for various Boston social events. Eleanor (Yeager) Payzant Johnson died in August of 1987. On November 14, 1988, 124 Commonwealth was purchased from Eleanor Johnson’s estate by Peter A. Latham, an engineer, and his wife, Francesca (Harding) D’Elia Latham, an artist. In April of 1989, the Lathams applied for (and received) permission to convert the property from a three family dwelling and a doctor’s office into a single family dwelling. On January 29, 1993, 124 Commonwealth was purchased from the Lathams by Thomas William High and his wife, Nancy Jane (Hughes) High. 124 Commonwealth remained a single-family dwelling in 2016.